Today, Eesti Gaas opened the first gas station in Estonia that also sells green gas, i.e. biomethane, at Tehnika 150 in the centre of Tallinn. Kalle Palling, the vice-chairman of the Environment Committee of Riigikogu, attending the opening ceremony was delighted that from now on, it will be possible to buy fuel of local origin from renewable energy sources at the gas stations of Eesti Gaas. “The Republic of Estonia has undertaken obligation to cover at least 10% of its liquid fuel use in transportation with fuel from renewable energy sources by the year of 2020 and about a third of it would be biomethane. Therefore I hope that Estonians who value environmental awareness more and more will also quickly come around to biomethane,” said Palling. 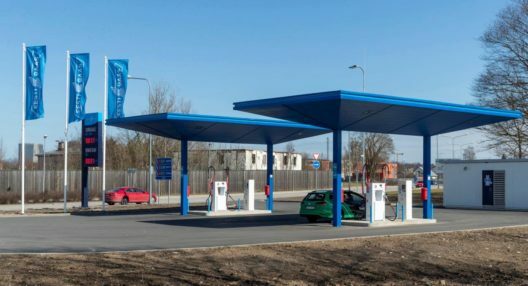 Sales of the novelty car fuel at Eesti Gaas stations become possible due to Rohegaas OÜ establishing the first biomethane production unit of the Baltic in Kunda. “From Eesti Gaas’ point of view, the sales of green gas, which is identical to natural gas in its composition but is produced entirely from renewable sources, is a logical decision for the future,” said Raul Kotov, member of the board of Eesti Gaas. “More and more compressed gas vehicles are coming to the market, people and companies increasingly acknowledge that that compressed gas is a favorable fuel of low emission when compared to gasoline and diesel,” Kotov noted expressing the hope that the city of Tallinn will also be able to transfer its public transportation to ecologically more sustainable fuel. Green gas or biomethane is produces from biogas. Biogas is a gas released as a result of fermentation processes that consists mainly of methane and carbon dioxide and is a normal component of our living environment. Just like natural gas, biomethane is a very clean car fuel. Upon complete combustion, only CO2 and water vapor will remain while CO2 emission is about 25% lower than in case of gasoline. Gasoline and diesel fuel combustion products are also toxic carbon monoxide, nitrogen oxide, hydrocarbons and soot. Gas engine causes a lot less noise. As gas is transported through pipes, it will not cause traffic load on roads and railroads and the exhaust gas and noise amount in the living environment will also decrease. Compressed gas is sold in kilograms and the price per one kilometer of driving on compressed gas is about twice lower than that of using conventional fuel. The cost of one kilogram of biomethane at Eesti Gaas stations is 0.821 euros. The price of compressed gas is 0.811 euros per kilogram. As of April, biomethane is available at the Tehnika street station in Tallinn; as of May, as the production volumes increase, the new product will be available also at other Eesti Gaas stations. Eesti Gaas has a total of eight gas stations – four in Tallinn, two in Pärnu, one in Tartu and one in Narva. The plan for this year is to open gas stations also in Viljandi, Rakvere and Jõhvi.